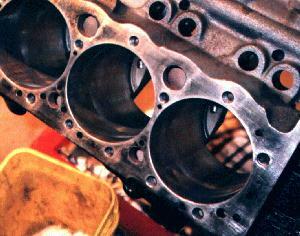 - It's very important to thoroughly clean the block before assembling the engine. Up to this point I had test fitted the crank and once I felt that everything measured right, it was time to start some serious cleaning. The block has to be cleaned with soapy water (dish soap works fine) and the cylinders brushed clean. The cylinder boring and honing leaves a very fine grit (around 1000 grit) that will very quickly grind your bearings down. - The block should be cleaned until a white lint free cloth has no residue on it. You have to dry the block quickly preferably with an air hose to stop surface rusting. The oil passages and lifter bores should be cleaned with a brass wire brush (steel brushes are a no-no as they will score the surfaces). I found that a toilet brush worked great as it was round and just about the same diameter as the cylinder and it was cheap! If this page has helped you, please consider donating $1.00 to support the cost of hosting this site, thanks.